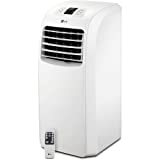 LG Electronics - LP0814WNR : Portable Air Conditioner Review • The Air Geeks, reviews of air conditioners, dehumidifiers and air purifiers. If your room is relatively small and you are looking for an economical air conditioner, then you don’t need a high capacity system. The LP0814WNR is designed to deliver a low cooling capacity and it is therefore ideal for small spaces. Creating a comfortable environment in a room needs more than just a system to cool the air. This system comes with many features that ensure that the air it blows into your room is cool, fresh, and free from excess moisture. So, is the LP0814WNR THE air conditioner you are looking for? Not so fast : its fan is loud for a unit this size, and in spite of easy set up, its performance is limited. But let’s get into details, shall we? First of all, we like the portability of this unit.The LP0814WNR is a portable unit that features castor wheels, which allow users to move the unit from one room to another without the need to lift or carry it. In addition, this sleek system weighs 47.6 pounds and it is therefore lighter than most portable air conditioners. The design of this system eliminates the need for permanent installation. Well, one of the most important factors to consider when choosing an air conditioner for your house is the cooling capacity of the system. If your space is small, then a unit with low cooling capacity is ideal for you. This portable system is engineered to provide a cooling capacity of 8000 BTU. According to the South Korean manufacturer, LG Electronics, this unit is ideal for a space with a maximum area of 200 square feet. However, the effectiveness of this unit can also vary depending on the conditions of your house and our opinion is that is stops being suitable for spaces larger than 150 sq ft. Yet, a stream of cool air is not enough if the amount of moisture in your surroundings is high. This portable system features a dehumidifier that effectively removes most of the moisture from the air. With a dehumidification capacity of 2 pints/hour, this unit is ideal for high humidity areas. In “real life” conditions, though, it will only dehumidify to the rate of ~1 pint / hour. Still not bad! Some air conditioners are designed to store the condensate in a tank – this requires maintenance. If the environment is humid, the tank must be checked on regular basis to avoid water leakage. The LP0814WNR utilizes a smart auto evaporation system that recycles the condensate for cooling. This eliminates the need for regular emptying of the condensate. The design of this portable unit ensures that the system can run for a long time without any worries of water leakage. In case you like systems that have a variety of control means, then you will certainly like the design of this portable system. To start with, it has a user-friendly interface that allows users to adjust settings with ease. Secondly, this sleek unit comes with a remote control that enables users to adjust settings from anywhere within a room. Lastly, it features a 24-hour on/off timer that allows you to program when and how it runs. You don’t have to be an expert to install this unit in your room. It comes with a well detailed manual that enables you to set it up with ease. With everything ready, you can install the system In less than one hour. One regret of ours is the loud fan operations: for a portable conditioner with relatively limited reach, the fan really shouldn’t be that loud. Unfortunately, most users will not be able to sleep with the LG LP0814WNR on in the same room. modifications may be required for the window vent to fit perfectly. It is important to use the manual during installation in order to get good results. The unit comes with an LCD remote control. Unit offers an energy saver feature. Recommended Room Size 200 sq. ft. Effective cooling. This portable unit brings the temperature down within a short time. However, it does so in a stream of cold air, so make sure you are not in the way otherwise you might freeze quickly! Intuitive commands, easy set up. We like it when it’s easy. The manual is well illustrated to enable you to set up the unit within a short time. Loud fan. Although most air conditioners produce loud sound, this unit is louder than it should be for its size. The exhaust heats up and it can easily warm the air around it therefore reducing the overall efficiency of the system. To counter this and increase efficiency of your unit, we advise you to wrap the hose with an insulator material such as foam. It can be difficult to install on some windows. Some minor modifications may be required for some windows. Most users who installed the unit on windows that slide horizontally had to do this. This air conditioner is a terrific fit for me! I love in a small efficiency (about 250 square feet) and it easily cools my apartment from 80+ outside to the 68-69 I like inside. 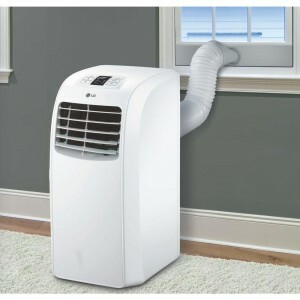 This air conditioner can be somewhat noisy on the high setting, but the noise is quite manageable on low. Two quick notes on this air conditioner: 1) it puts out a very noticeable "stream" of cold air. Thus, you may find yourself freezing if you do not have an out-of-the-way place to put the air conditioner. Be careful when installing the window kit--if you don't make an airtight seal (or at least near air-tight), you will find that hot air flowing back in negates the effects of the air conditioner." We live in Southern California near the coast. Like most older homes in the area, we do not have central air. Thanks to the beach breeze, it doesn't get hot too often. On those days when temperatures reach in the 90s, we pull this out. It doesn 'to make the room ice cold, but it keeps in tolerable. It definitely is loud, but no more than other portable ACs in the market. The only thing I have an issue with is the vent hook up to the window. We have windows that slide horizontal so that makes the set up more difficult. It would be nice if they could one day design an easier window set up. Once set up though, there isn't much too do but turn it on. If you need your room to be an ice box, I would consider one of the more expensive and larger units. Otherwise, if you just need to use it a few weeks out of the year, I think this is a good choice for the price." The LP0814WNR is a highly effective system that cools and dehumidifies a room within a short time. It performs excellently when installed properly. This easy-to-use unit comes with many features to enable you to get the most out of it. However, its loud fan is a problem for non-heavy-sleepers. That is too bad, for an otherwise very satisfying model.